New York Times: "Pinochet is Fit for Trial"
John Dinges, The Condor Years: How Pinochet and His Allies Brought Terrorism to Three Continents (The New Press 2004/2005). Operaci�n C�ndor: Una D�cada de Terrorismo Internacional en el Cono Sur (Ediciones B noviembre 2004). Spanish translation by Ediciones B, Spain and South America. French and Portuguese translations. "Kissinger explained his opinion that the Government of Argentina had done an outstanding job in wiping out terrorist forces." --State Department cable, 1978. This is the underground history of the international Dirty Wars by U.S. allies in South America. It is the first "War on Terrorism" and the parallels to the current wars are a cautionary tale. For much of a decade, six allied military governments engaged in secret warfare intended to wipe out their enemies, kidnapping and murdering up to 30,000 people. At the initiative of Chilean president General Augusto Pinochet, and with initial encouragement from the CIA, they set up a multinational terrorist organization, Operation Condor, to pursue those who escaped to other Latin American countries, Europe and the United States. Award-winning journalist John Dinges, using newly available U.S. documents and the dictatorships' own files, tells this gripping story from the point of view of those who have tried to keep it secret. He dispassionately lays bare the true extent of U.S. complicity in the crimes of the dictators who called the United States "the leader." Revolutionaries, intelligence operatives, U.S. officials--many speaking for the first time--recount the brutal struggle between Condor and its enemies. Revelations in the book include the never before told story of U.S. intelligence lapses that detected, but failed to prevent an assassination by our anticommunist allies in Washington, DC. Now, after decades of relentless pursuit, investigators and judges are using the international trail of Condor�s crimes to reverse the impunity the generals have enjoyed for so long, starting with Pinochet�s own arrest in London. The still-ongoing Condor prosecutions are changing international human rights law forever. Index terms: Operacion Condor, Chile, Argentina, Uruguay, Paraguay, Brazil, Brasil, Bolivia; Human Rights, torture, repression, CIA, Central Intelligence Agency, Junta Coordinadora Revolucionaria, MIR, ERP, Tupamaros, ELN, Che Guevara, Roberto Santucho, Henry Kissinger, DINA, Military intelligence, inteligencia militar, revolution, Salvador Allende, Stroessner, Hugo Banzer, Jorge Videla, Aparicio Mendez, Juan Jose Torres, SIDE, SID, SIE, Batallon 601, Robert Scherrer, Carlos Prats, Zelmar Michelini, Hector Gutierrez Ruiz, Michael Townley, FBI, Ed Koch, Orlando Letelier, PVP, OPR33, Bernardo Leighton, Baltasar Garzon, Baltazar, assassination, terrorism, war on terror, intelligence failure, Andres Pascal Allende, Edgardo Enriquez, Miguel Enriquez, Manuel Contreras Sepulveda, Jose Osvaldo Riveiro, JorgeOsvaldo Rawson. El Mostrador: "John Dinges lanza 'libro definitivo' sobre la alianza del terror." Toronto Now: CRUEL CONDOR "Dinges writes that echoes of the Condor campaign reverberate today in the massive pooling of intelligence, the compromised intelligence relationships, the gleaning of information from the torture centres run by U.S. allies and even cross-border targeting for assassinations." 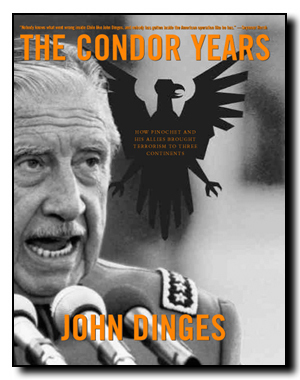 The Miami Herald: John Dinges lifts the lid on Operation Condor in this compelling and shocking account� As Dinges reveals, Condor was far more sinister than once thought. "As a secret treaty," he says, "Condor elevated human rights crimes to the highest level of state policy, under the direct control and manipulation of the heads of state and ministers of government." And he backs it up. San Francisco Chronicle: "Dinges is able to go into remarkable detail in exposing the actions of both the opposition groups and the military strongmen who battled them." The Washington Post: "Dinges assembles a scrupulous, well-documented and indignant prosecutor's brief, all the more arresting for its judiciousness and restraint." Foreign Affairs: "This is a remarkable book and a major contribution to the historical record." Publishers Weekly: "Soon enough ... vivid stories and details emerge: double agents, the euphemisms of the spy trade (e.g. "wet work" for assassinations, bumbling murderers and rebels, and cynical U.S. diplomats. Dinges's meticulously documented study is a cautionary tale for today's war on terror..."
Seymour Hersh: "Nobody knows what went wrong inside Chile like John Dinges, and nobody has gotten inside the American operation like he has."